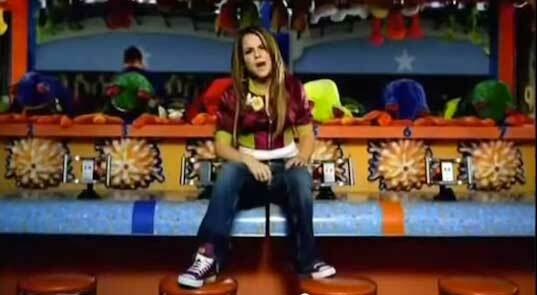 “Baby It’s You” was released in 2004 by singer JoJo. This video takes place at Six Flags Magic Mountain and Hurricane Harbor as JoJo and her friends walk around the park playing games and having a good time together. JoJo is also an actor appearing in movies like RV with Robin Williams and Josh Hutcherson or Aqua Marine with Emma Roberts. JoJo and her friends walking into the park. This song is about a girl who only wants a guy to love her and treat her right by spending time with her and showing he cares about her. Some lines in the song are “It don’t matter that your car is fly, and your rims are spinning on the side n’ it don’t matter where we go tonight cause if I’m with you I’ll be all right.” Here she explains how she doesn’t care if you have the nicest car or you take her to expensive places as long as you give her your time she will give you hers. JoJo sitting on an arcade game. Gifts are always nice, but there is more to a relationship than buying materialistic things to show you care about someone. The saying “money isn’t everything” really is true. Finding someone who loves and cares about you and wants to be apart of your life is something money can’t buy and is something that everyone wants. Time is the most precious thing we have and to give our time to another person means so much more in the end than any gift every given or received. So next time you want to get a boy/girl to like you try make them feel like you want to spend time with them and get to know them and just be yourself because I bet they will like the real you better than anyone you pretend to be. JoJo dancing in her red chucks. Get yourself a pair of chucks by clicking on the links below.